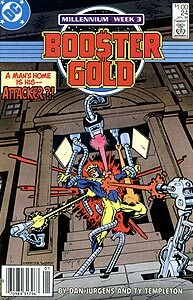 Cover Description: Booster Gold is attacked by lasers and mechanical tentacles on the front steps of his Metropolis mansion. Brief Synopsis: When one of Booster's trusted friends is revealed as a Manhunter agent, Booster re-evaluates some of his choices. Issue Notes: Millennium Week 3 tie-in. The events in this issue were set up by the events in Millennium #3. In the letter column, Dan Jurgens confirms that this is the penultimate issue of the Booster Gold series. Booster makes a typically Booster mistake. Equating money to loyalty, he assumes that since he pays his employees well, they won't turn on him as so many other superheroes friends have during the recent Millennium related events. Booster is concerned that if his computer defenses are malfunctioning, they may injure a Girl Scout. Girl Scouts have been selling cookies door-to-door for so many years (since 1917!) that the presence of a young girl in a uniform on a doorstep has become a fixture of popular culture, even to Booster Gold. The voice of Booster's tormenter announces that "every erg of energy" is being drained from Booster's power cells. An "erg" is a very minute, practically archaic standardized measure of energy. It has been equated to the amount of energy a mosquito uses to take flight. ...a fact that Dirk immediately dismisses as a computer glitch just before accusing MacKenzie Garrison of sabotaging the mansion defenses to attack Booster. Subtle, Dirk, subtle. Trixie breaks the news to Booster that he's broke. Despite years of trying, he still hasn't regained his lost wealth. Trixie at last admits that she was falling in love with Dirk. Trixie has been put through the emotional wringer since joining Goldstar, Inc, originally appearing to be a love interest or Booster himself. MEET THE PRESS: Tired of fighting, tired of losing those he cares about, Booster finally submits and agrees to join the Manhunters on the condition that they keep his past a secret from the public and return his money. Booster hold a press conference in Los Angeles to announce that he is siding with the Manhunters. Booster also calls for the disbanding of the Justice League as a group manipulated by an alien presence. Booster is one of very few heroes to publicly side with the Manhunters in the Millennium event. With no obvious reference, the lion figure in the background of this panel is most likely a rather oblique allusion to the power medallion of another hero who was also a Manhunter agent, Mark Shaw (first appearing in 1975's First Issue Special #5). Boosterrific Review: A familiarity with the events of the mega-crossover event Millennium isn't strictly necessary for the enjoyment of this issue, but it greatly helps. Fortunately, Ty Templeton returns to make the best of the confrontation between Booster Gold and his personal Manhunter. (Hint: it is someone who has betrayed Booster before.) The events of this issue are both action-packed and tragic, as Booster Gold, who lost his twin sister not two issues previous, now loses his fortune and reputation. Not exactly a fun and uplifting experience, but an enjoyable read nonetheless. A solid read. The worm in the apple could have been predicted. Booster has his flaws but I did not like the way he turned on the JLI. That could have been done better.